The Waste heat comes from the drive motor and power electronics. 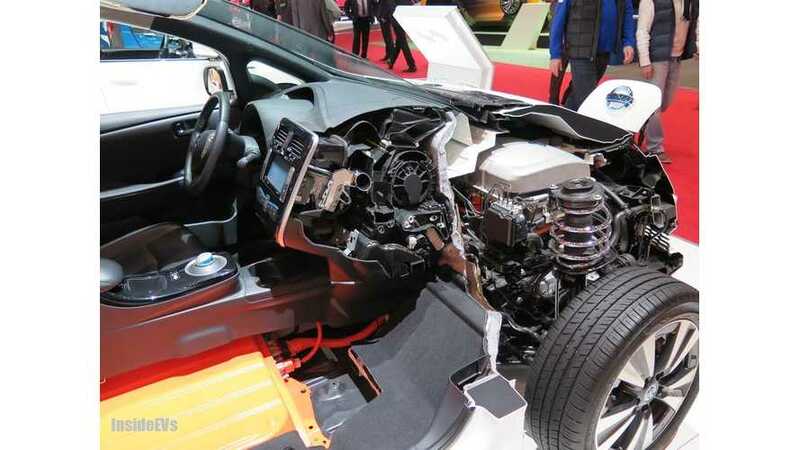 Range loss in cold weather is a huge problem for pure battery electric vehicles and manufacturers use various approaches to deal with the problem. The simplest approach is resistive heating in the cabin and/or battery. This is the low cost approach but it also results in the largest penalty on range. Other manufacturers like Nissan use a heat pump. The heat pump improves range loss but adds expense. A heat pump is an air conditioning system run in reverse that pulls heat from ambient air. Have you ever wondered why the Tesla Model S doesn’t have a heat pump? Certainly cost is no object in a luxury car costing as much as $100,000. Perhaps the reason Tesla does not use a heat pump is that they have a better way to do it. Tesla has a patent app outlining a practical approach to cabin heating where waste heat from the drive motor and power electronics is used to warm the cabin. As it turns out, the production model S uses a similar but subtly different approach. Waste heat from the drive motor and power electronics is still used to warm the vehicle. However, Tesla chose to heat the battery instead of the cabin with the waste heat. What are the finer points on how the production vehicle and the patent differ? The patent shows waste heat being used in the cabin as shown in the following simplified sketch. A detailed technical sketch is provided in the original article. 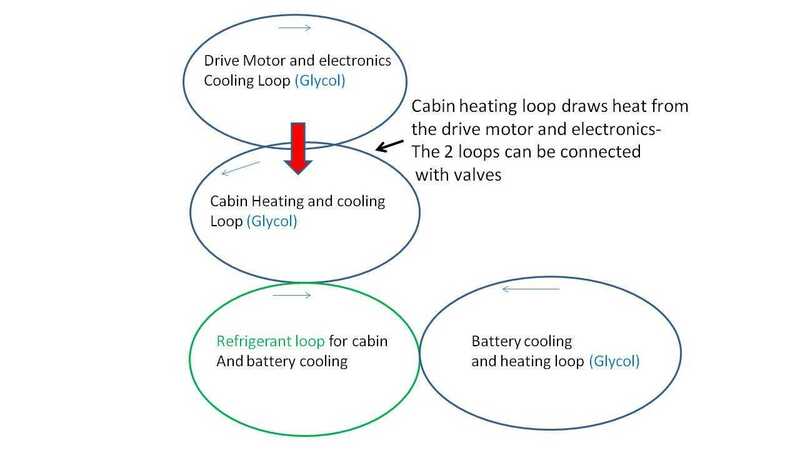 In the patent the cabin liquid glycol heating loop can be connected to the drive motor and power electronics glycol cooling loop with some valves. Note that the patent shows 4 loops: 3 glycol loops and one refrigerant loop. There are two big changes between the patent and the production vehicle: the waste heat is used in the battery instead of the cabin and one loop has been eliminated. The production vehicle now has only three loops, not four. Tesla eliminated the Glycol cabin loop. Do we know this for sure? Is it 100% proof positive that this is the case in the production vehicle? Tesla takes a different approach. Once you start driving, heat generated by the motor is used to heat up the battery. This approach is more efficient, since it uses waste heat rather than electricity. But it takes a while to work because the motor doesn’t produce much heat. As a result, it might take several minutes before the battery is warm enough to provide full acceleration. In addition we have some screen shots of the Model S in “diagnostic mode”. 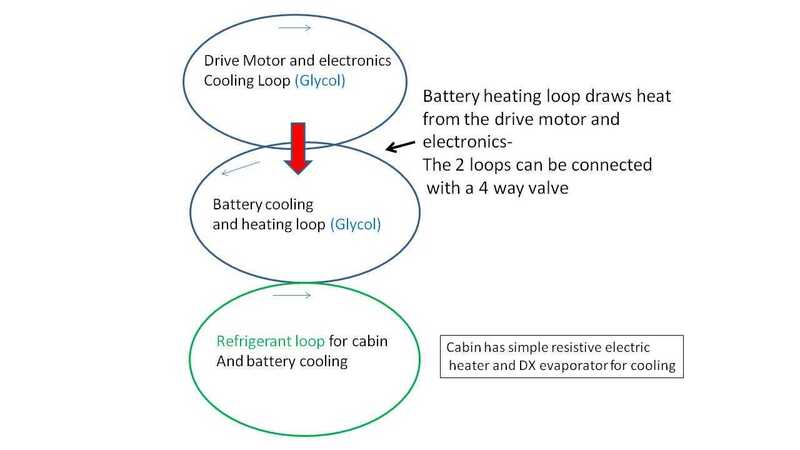 This diagnostic mode schematic was posted on the Tesla Motors Club forum in regards to our article Tesla outlines practical approach to cabin heating with the following comment by member “Ingineer” (an electrical engineer). While there is no way to use drivetrain waste heat to warm the cabin, they can use it to warm the pack when it's cold. 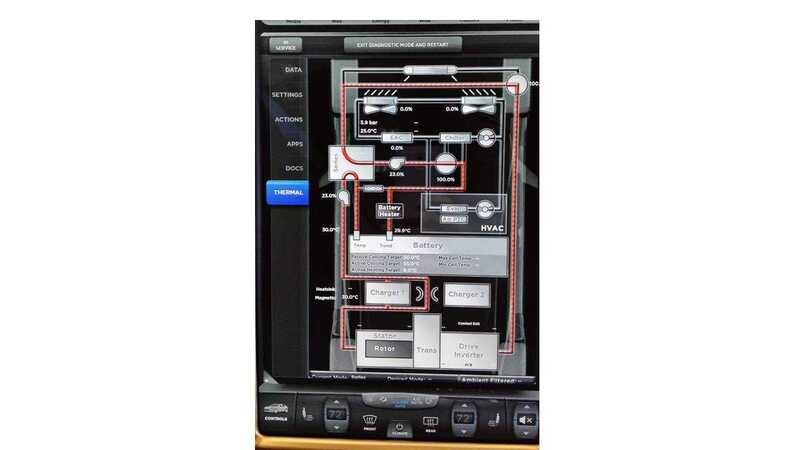 Here is the diagnostic mode system schematic. Diagnostic mode showing battery loop in parallel -not connected- with the drive motor and power electronics loop. Courtesy: Tesla Motors Club member “Ingineer”. In another sketch we see the drive motor and power electronics loop hooked in series –connected-with the battery cooling loop. So while we have no direct confirmation from Tesla that this cooling scheme is used in production, all evidence indicates that Tesla Model S warms the battery with waste heat from the drive unit and power electronics. We do not have direct word from GM as to whether the Bolt EV will have a heat pump. 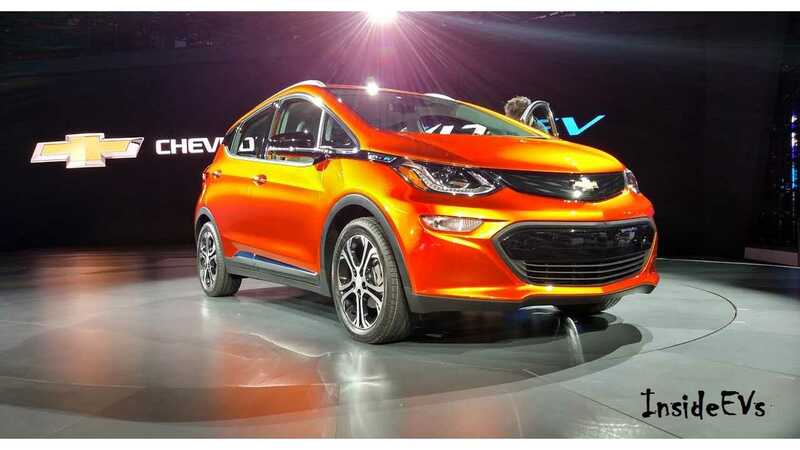 However, some GM-Volt forum members who attended the NAIAS claim to have heard Pam Fletcher, executive chief engineer of electrified vehicles, say that the Bolt EV will not have a heat pump but that the Bolt EV will have a similar heating scheme as the Volt EREV only “improved”. What could this improvement be? 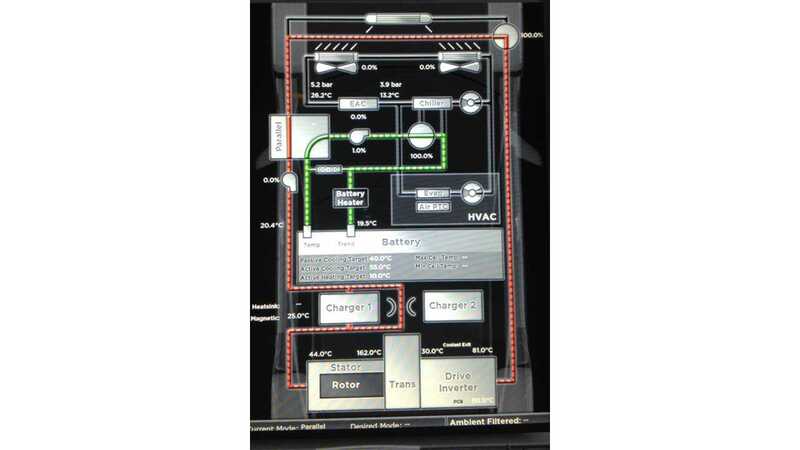 Perhaps it is waste heat recovery from the power electronics and/or drive unit. The scheme is easily implemented, low cost, improves cold weather range and is in tune with the “keep it simple” approach GM has used in the Chevy Bolt 200 mile EV. In another interesting twist, the Bolt EV uses a glycol loop for cabin heating –Tesla doesn’t- so GM could use waste heat in the battery OR the cabin. About the authors: George Bower is a retired mechanical engineer with over 20 years experience in gas turbine power systems. Co-Author of the piece, Keith Ritter is a mechanical engineer, and licensed professional engineer with over 35 years of experience in heating ventilation and air conditioning systems.